Les will approve the booking and put it in the diary. He will authorise collection at the appointed time from Gorton Services at the entrance to the Hornsea Pottery. A key code will be issued for the keysafe which is by the door to the premises. Please, respect the one way system around the premises. A single car may be left parked in place of the minibus. Before moving the minibus, drivers should enter up the mileage log sheet and damage report. 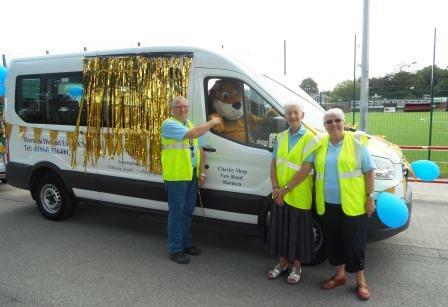 If a member of the Lions finds unreported damage, or mileage, when inspecting the minibus upon return, the Lions Club will be notified and the driver could be barred from using the bus again. Because of excessive damage being done to the bus, users of the minibus should be aware that the appointed driver should be tested on driving the bus prior to use commencing. Also if the bus is damaged, the user will have agreed as a condition for using the bus to contribute to the cost of damage. For full details please, contact Lion Les Short who will issue you with a formal letter detailing the terms and conditions. Please note our bus is not suitable for young children, unless you provide your own booster seats !. Passengers are reminded that UK. Law requires that seat belts are worn on all journeys. The Bus is NOT Available to Hire or Sub-Hire, nor is it available to Private Business. Please, note that the use of the bus is restricted to within sixty miles radius from Hornsea. If you wish to take a trip further afield, then please, contact other providers.